Thanks to everyone who joined in this month's Bloggers' Dinner Party! I have a confession... I got so caught up in the packing and preparing for our move, that I ran out of time to make my own project this month. 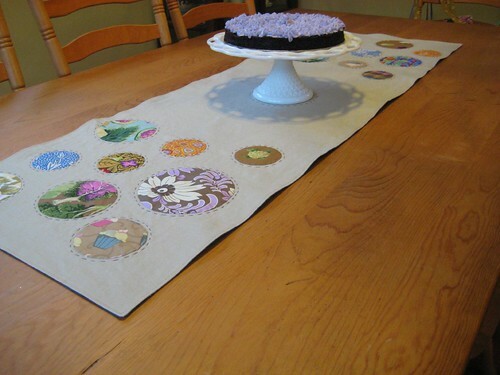 I was really sad because I was actually thinking I would make a table runner, I was so inspired after putting together the round-up. There were lots of fun entries for this month, though, so hopefully you guys will enjoy checking them out and not mind that I didn't get to my own project. B. Yazoo linked up a super-cute set of placemats that she made using Sugar Pop and Kona Coal, and she made each one in a different design - I had a hard time picking which to feature, they were each so cool! Michelle from City House Studio showed off some fun projects for her kitchen nook, including a beautiful lattice pillow to match her cushions, and these matching double-sided napkins. Tori at One Eleven entered this cute potholder - I love the fabrics she used and the red bias tape sets them off perfectly. 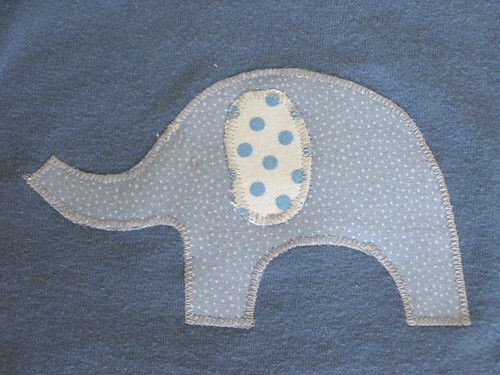 Lindsay of Lindsay Sews made a fun potholder, too - I love the block design she used and the cute button on the handle! ... Is B. Yazoo! I'm sending you an email now. 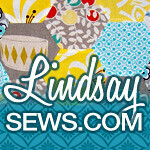 Finally, a big thanks to Lindsay of Lindsay Sews for volunteering to host the party next month while I am in the midst of moving! I am excited to have the party travel around (while I am traveling around too) and can't wait to see what you guys make. Head over to Lindsay Sews to see the great prize Lindsay rounded up for you guys (including something special from Sew Sara). And in the meantime, I will be back with a few more posts about my sewing projects before I disappear for the move. Thanks to everyone who has been joining in the Bloggers' Dinner Party! It has been fun seeing your creations. The party is open until the 28th so you have 10 more days to join in this month's party - and you'll have a chance to win a pattern and some fun fabric from my stash! 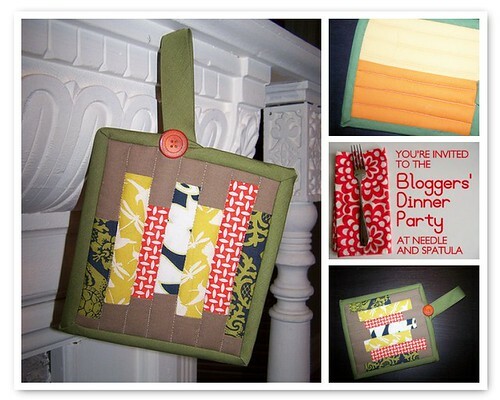 You can link up over at the Bloggers' Dinner Party page. In case you are looking for inspiration, I wanted to share a roundup of fun table runner techniques and ideas. I have actually never made a table runner, since our current dining table is too narrow to fit a runner and leave any room to actually eat. Looking at all these great tutorials made me really want to make one, though! I'm thinking maybe I should just go ahead and make one, I can always use it on a coffee table or a side board in the future if we continue to have too small a table after we move. The simplest way to make a table runner is to sew two rectangles together with right sides facing, leaving a gap for turning the runner right side out, and then either hand stitch the opening closed or top stitch all the way around, closing the opening in the process. The beautiful simple runner above from The Long Thread is an example of this technique, showing how with even minimal piecing you can get a very pleasing result. 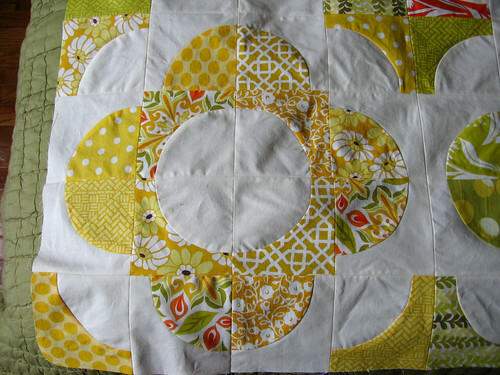 You can also use this technique with a more complicated top, such as the lovely crop circles pattern from Poppyprint above, or the beautiful log cabin runner that Amanda Soule made. 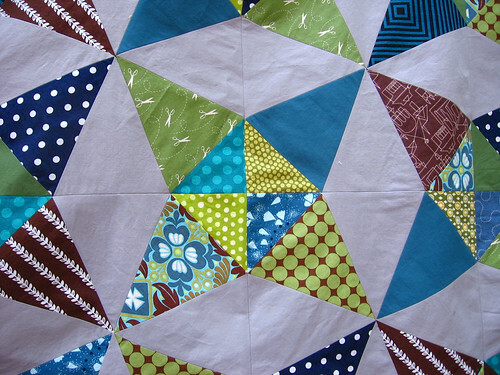 With this technique you can use batting in the middle and quilt as much as desired, or you can just use the two pieces of fabric. 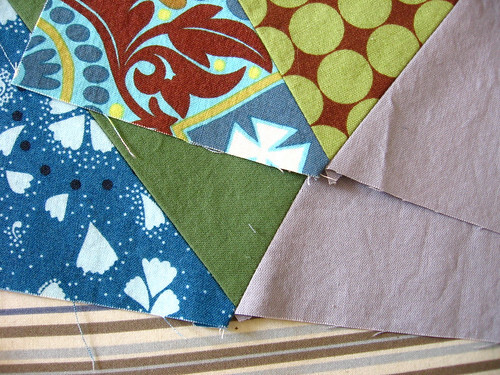 Another simple technique for a non-quilted runner is to simply use a single rectangle of fabric and turn the edges under and finish them, similar to how you would when making a napkin. You can of course embellish the fabric with applique, contrasting fabric bands, stenciling/stamping or other decorations, just as you can with napkins. The linen and lace runner above from A Sewing Journal is a sweet example using this technique. 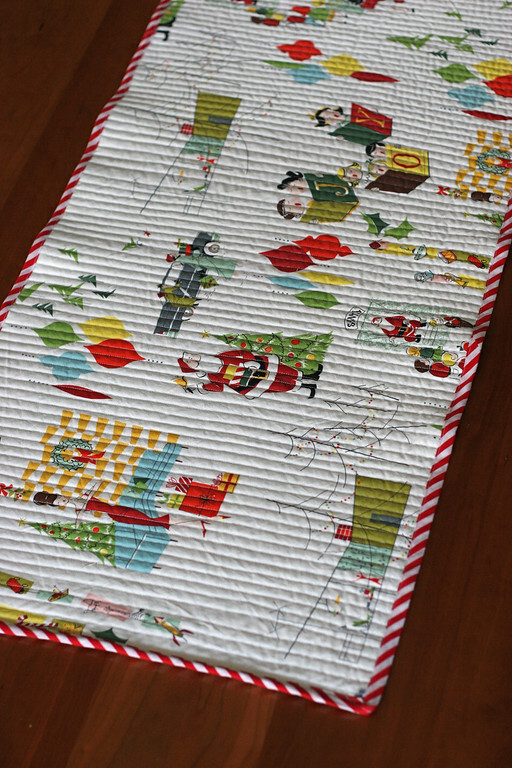 You can also make a quilted table runner with binding, which is essentially a mini-quilt. If you use extra layers of batting or insulated batting, this has the added benefit of protecting your table from hot dishes. 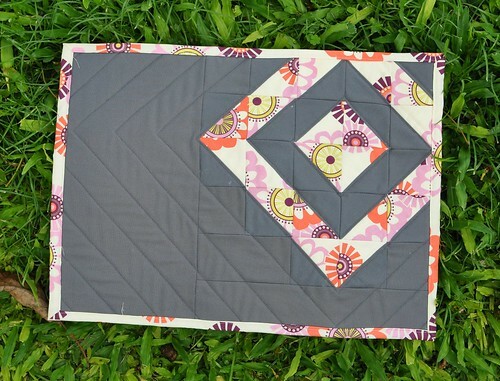 At the most simple, you can pick two favorite fabrics, quilt them together and sew on a binding, as in this tutorial from Prudent Baby shown above. You can also make a striped table runner using this technique pretty easily, such as the quilt as you go table runner from Diary of a Quilter shown above. Similarly, the Polka Dot Chair has a tutorial for a skinny table runner made from squares. 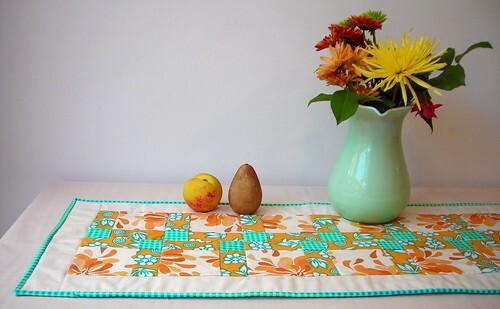 And your table runner doesn't have to be a rectangle! I love this pattern for a leafy runner made of bias-tape edged leaf shapes from Martha Stewart Crafts. 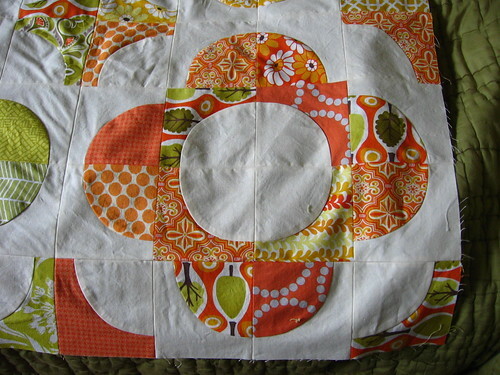 Or there's a cute pattern on Moda Bake shop for a runner made of layered circles. What is your favorite table runner pattern or technique? I finished my drunkard's path quilt top last night - I am really happy with how it turned out! 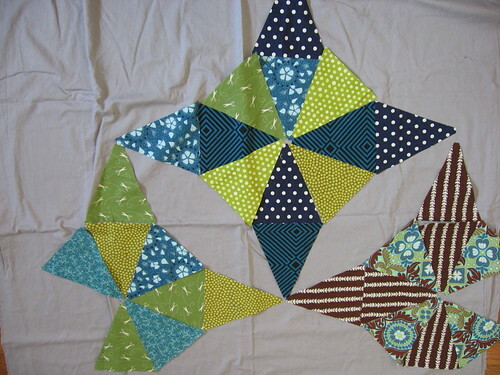 I had posted a photo on the needle and spatula facebook page showing a possible layout of the blocks with the yellows on the diagonal and got good advice from several folks to put the oranges down the diagonal since it is a more dominant color - which was kind of what I was thinking too after I saw it laid out. 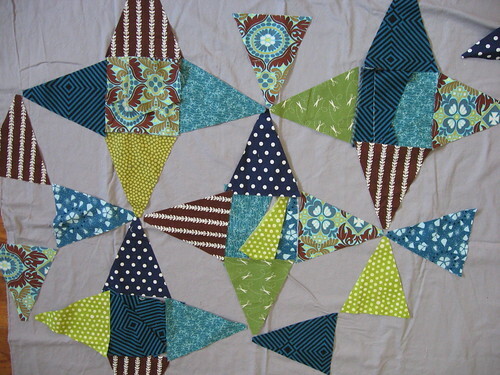 I'd love advice on how to quilt it - I am thinking I may just do diagonal lines through the sub-blocks because while I think echo quilting would look lovely I don't think I'm up for it on my tiny machine. 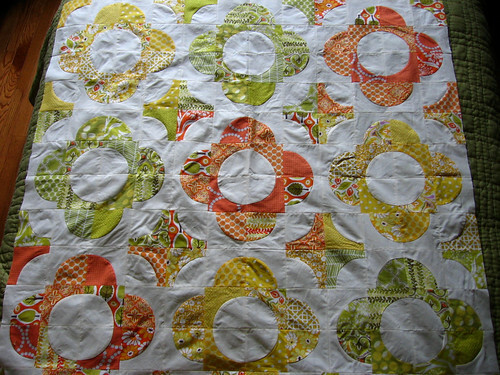 Here are more closeup shots of the orange and yellow blocks - I used mostly central park fabrics (including parts of a charm pack leftover from my last central park quilt), but added in other coordinating fabrics from my stash as well. 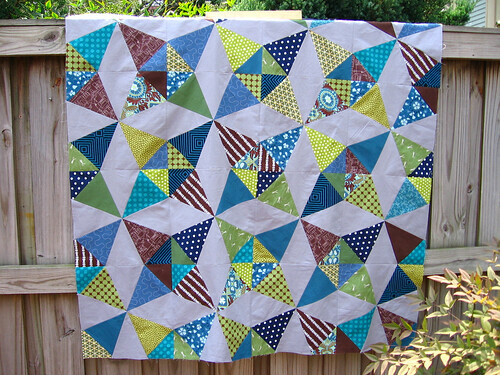 I love the color scheme for this quilt but I also think it would have looked great with a wider range of the colors from this line. 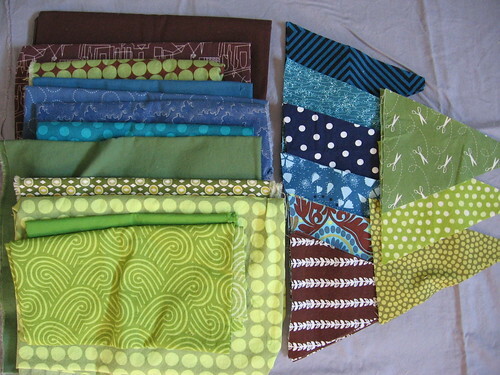 Since I have used stash fabrics in each of these central park quilts as well, I think I have enough fabric left for another central park quilt, probably using the whole range of colors - which is great since I love this fabric line! I have mentioned to a few folks that I was thinking about doing a drunkard's path quilt-along once I finished up this quilt. 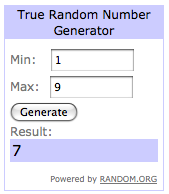 I am pretty sure that I am going to go ahead and do it, so stay tuned for more details! Since we are moving across the country next month, the QAL probably won't really start until mid-September or even October, but I am hoping to write a few posts for August/early September with more inspiration/layout ideas. I am super excited about it, I hope you will consider joining in! 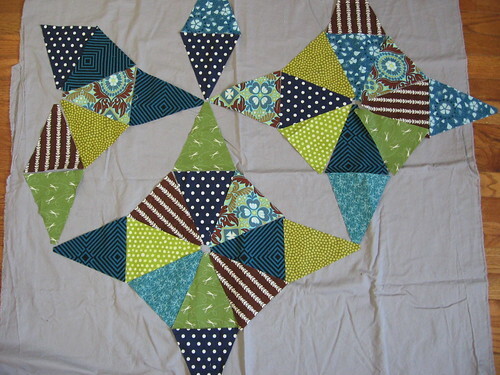 With the central park quilt top finished, I have finally moved on to start my kaleidoscope quilt for Elizabeth's quilt-along! I am mostly using the same fabrics as my original stack but with a few additions, and I did decide on the lighter grey color for my solid, thanks to everyone who chimed in with an opinion on that. 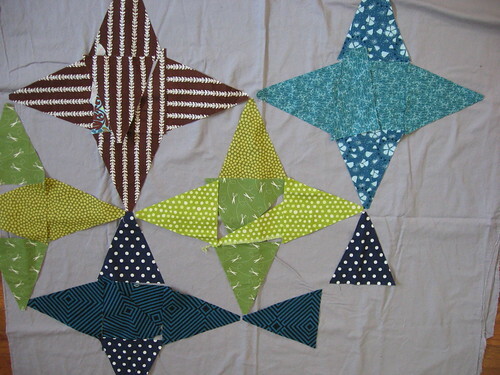 I am planning to make the baby size quilt and have already cut out 34 of the 48 needed triangle pieces and have used less than half of the fabrics, so I'm not sure if they all will make it in... but I may make it a slightly larger 4 blocks x 4 blocks (rather than 3 x 4), so then I would be able to fit in more fabrics. I have been playing around with layouts a bit before I finish cutting my pieces (so I can make sure I cut the right number of each size/color for whatever design I choose), and I was really drawn to this larger design variation that some folks had done. I was thinking about a scrappy option (above) or a more color coordinated option (below) - and I played around with a few other options too, which you can see in my flickr stream. I realized that this design wouldn't work very well in a baby-sized quilt, though - there just isn't enough room for the large scale repeats, so you basically only get the larger circle pattern showing once (or maybe a few times in the 4 x 4 sized quilt). So, I think I am going to stick with the regular layout in the end. 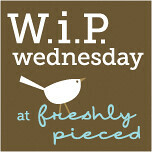 I'm not sure yet if I will got with a scrappy layout (above), a color coordinated layout (below) or something else... but at least now I know to go ahead and cut out the half square triangle pieces (and apologies for the centers being filled with scraps in these photos, since I hadn't cut out any of those pieces yet). Since Wednesday, when I showed off a few t-shirts that I had sewed, I have made several more t-shirts and then decorated them all. 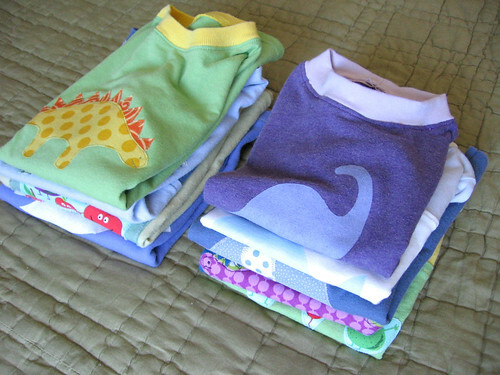 I was having so much fun making them that I went to the thrift store and bought some more t-shirts and jersey pillowcases to repurpose so that I could make more of them! 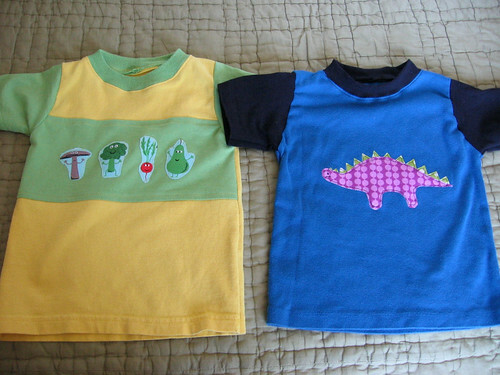 I ended up making 5 small (18 month size) t-shirts for my nephew (who is about to turn 1 - but I think he is on the big side and I wasn't sure how the sizing would work so I erred on the side of larger), and 4 larger (4 year old size) t-shirts for project first day. It's a good thing I didn't get more supplies at the thrift store or I would still be making these, they are so fun to make and to decorate! And I also decorated this bigger sized one with a whale. 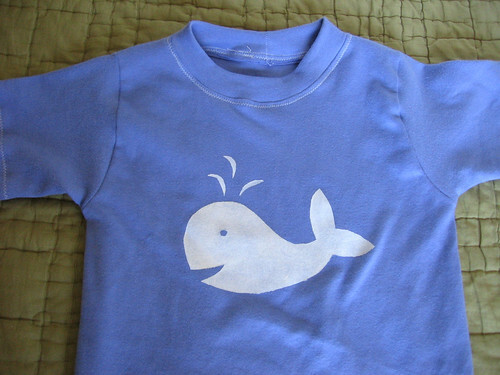 I was a little concerned that the blue might look too lavender colored to be for a boy, so hopefully the whale helps keep it boy-appropriate. I ended up decorating most of them with fabric appliques, though, which I think turned out really cute! These are both the little size. I colorblocked the green and yellow t-shirt (and a number of others you will see), mostly because the fabric wasn't big enough otherwise. The pattern (charlie tee from Fishsticks Designs) has pattern piece options for colorblocking but I just winged it, sewing the fabrics together first and then cutting the pattern piece out of the colorblocked piece. 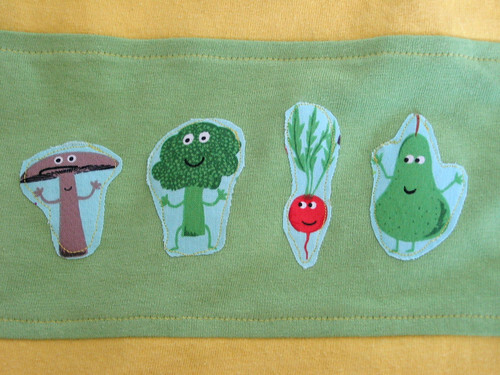 I used some of my leftover edgy veggie fabric from backing the rainbow rail quilt to applique a few cute veggie guys on the front band of this shirt. I used the stretch stitch (that looks like a lightning bolt) to do all the seaming on these t-shirts, usually with my walking foot, and as you can see it looks mostly like a straight stitch and works fine even for top-stitching. 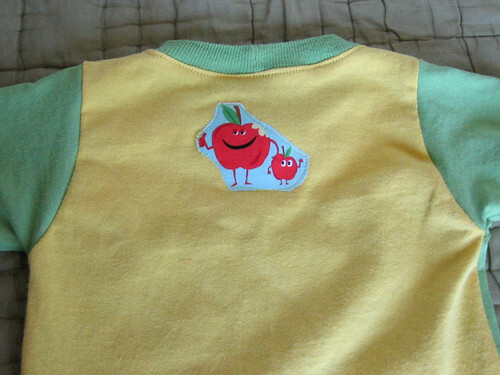 And I put a cute pair of apples on the back, too. These two are the bigger size. On a lot of these tees I was able to reuse the existing hem from the t-shirt and on the sleeves (adjusting the pattern to remove the hem allowance), and on both of these (and a few others) I was able to reuse the neck ribbing too - it was kind of a pain to rip out of the original t-shirt, but the necklines definitely turned out the best for these so I'm glad I did it! You may also be noticing that I really liked the look of using one color for the body of the tee and another for the sleeves and neckline - it works out well because you can basically combine two existing tees to make two new ones. 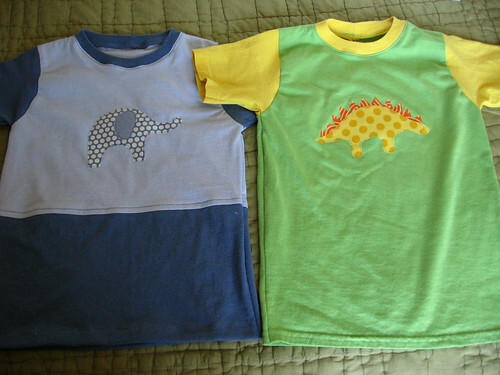 I love the cute dinos on this t-shirt and on the blue t-shirt! I especially like the little face I was able to make since I did free-motion applique to sew it down. 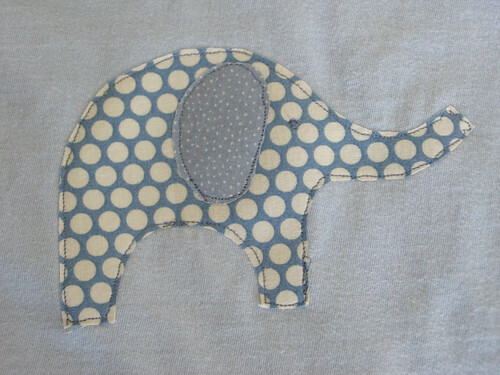 I love the elephant too. 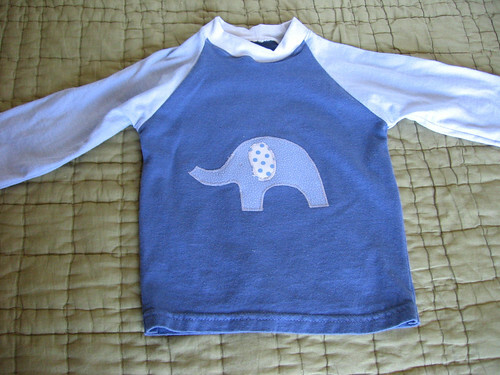 I also made a long-sleeve raglan t-shirt in the little size with an elephant on it. 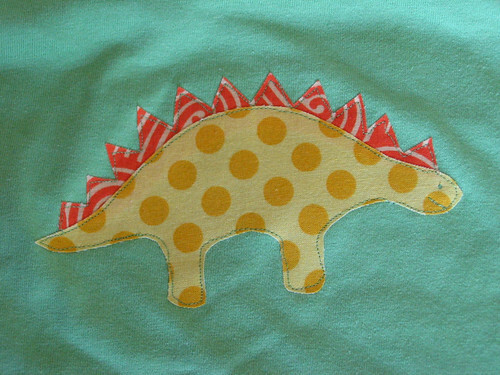 This was the first applique that I did of the set and I sewed it down with a zigzag, which I think looks cute too. I ended up doing the rest with free-motion applique because I found it a bit easier and I like the loose drawing-like quality of the line. 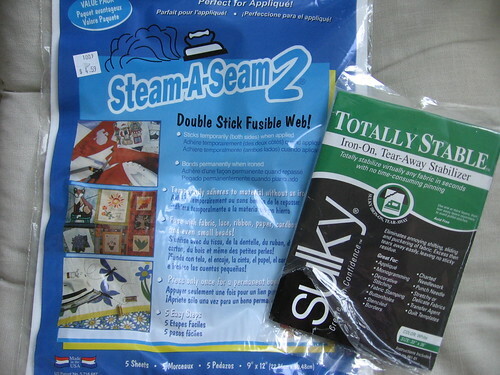 At first I used both fusible web and iron-on tear-away stabilizer when I was doing the appliques, but towards the end I realized that the fusible web alone really stabilized it enough and I skipped using the stabilizer. For most of the t-shirts, I did the applique after I cut out the pattern pieces but before I assembled the t-shirt, so that the fabric was easy to keep nice and flat. 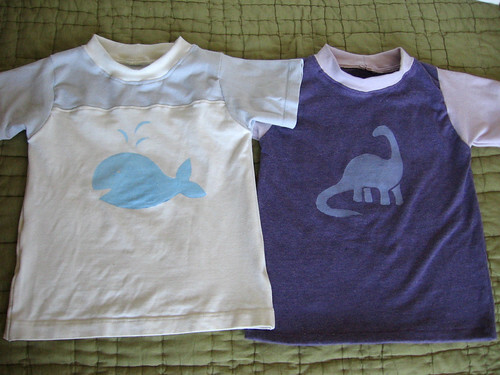 I did sew the purple dino on the blue shirt after it was already assembled, though, and it worked fine too - I just had to go slow and adjust it a few times. 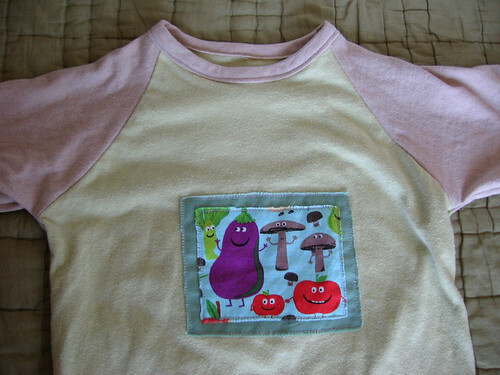 Finally, I also made a raglan tee in the bigger size (using the fishsticks Rockin Raglan pattern) with an edgy veggie fabric patch on front. For this patch, I wanted to edges to be frayed so I didn't use the fusible web and so I did need to use the stabilizer. I used a few dabs of glue to keep the two layered fabric patches in place sewed both down with a straight stitch, going around twice to make sure they were well-secured since they weren't fused in place. Then I used my fingernail to loosen the stray threads and fray the edges a bit. I also did a different neck on this t-shirt because I didn't have any matching ribbing, interlock, or extra-stretchy jersey. I just used regular jersey and sewed it on in a single layer, than folded it around to the back and top-stitched it down - it makes a cute, thinner neckline. I know those directions probably don't explain it well enough, I am hoping to do another project soon that uses this and I'll be sure to take pictures to explain it better if I do. Sorry for the super long post, I just had so much fun making these that I wanted to show them all to you! Roasting vegetables is one of my favorite cooking methods - it's a great way to bring out the flavors and an easy technique when you don't feel like doing anything particularly fancy but want a delicious veggie dish. I also find that I often roast vegetables when I am cooking a casserole or another dish in the oven - I figure, as long as I have the oven heated up, I may as well pop something else in to cook as well (this is also often when I cook pita bread or other bread). These are two simple roasted vegetable "recipes" (really more of a technique) that I have been wanting to share, so I thought I would combine them into one post. I basically followed the recipe at the link above so I won't retype it here, but I did substitute olive oil spray for the regular olive oil as suggested in the comments. I also baked them on one of my silpat mats because I didn't have any parchment and it worked fine (I am sure you could also just bake them on the cookie sheet, too). I think I baked/roasted them for about 8-10 minutes but I don't really remember. These seemed more like a vegetable side dish to me than a finger food or a chip, per se, but they certainly were yummy so I definitely would recommend making them! 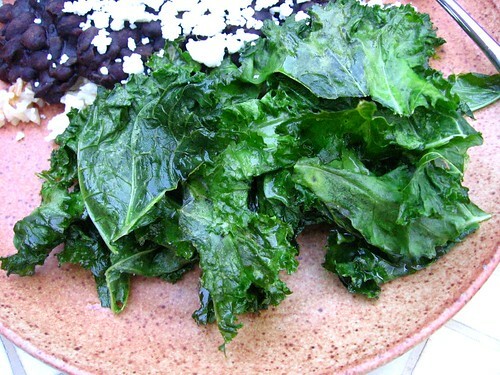 Interestingly, this is basically the same recipe as the kale. 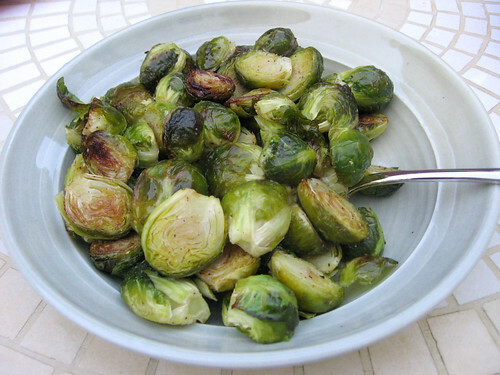 It really is the perfect way to bring out the delicious taste of the brussels sprouts without anything else to distract from them. 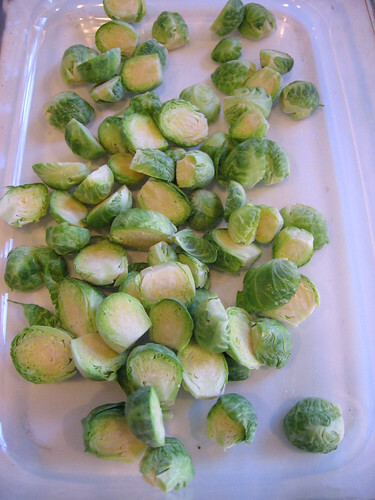 I just bought another bag of brussels sprouts so I plan on making these again soon! 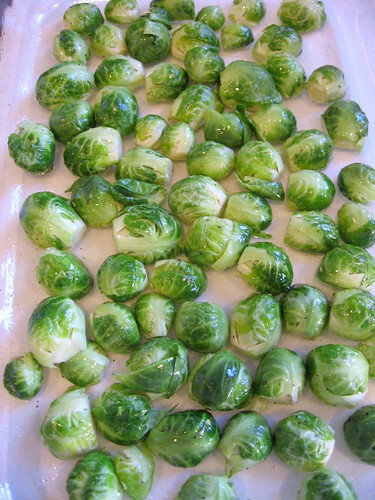 To make these, preheat the oven to 400 F. Toss the cut brussels sprouts with the oil, salt and pepper in a baking dish, than arrange them facing down on the baking dish. 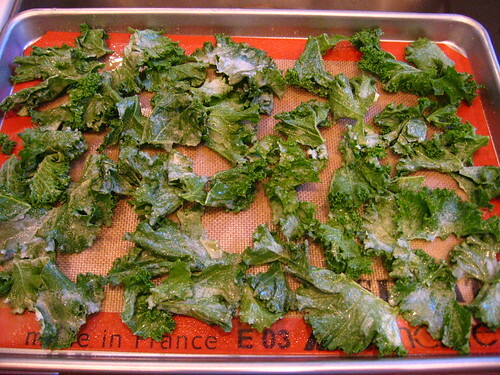 Bake for 15-20 minutes, until they start to brown at the edges. Serve warm. What are your favorite types of roasted vegetables? 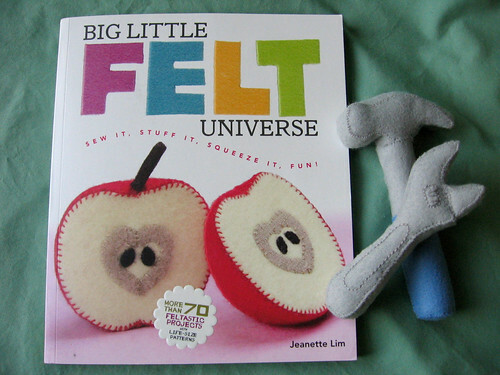 After I mentioned in my post about making felt food that my carrot was based on the design in Big Little Felt Universe but I didn't actually own the book, the publisher Lark Crafts contacted me to ask if I would like a copy to review. Having had a chance to look through the book briefly, I knew how great it was and didn't hesitate to say yes! 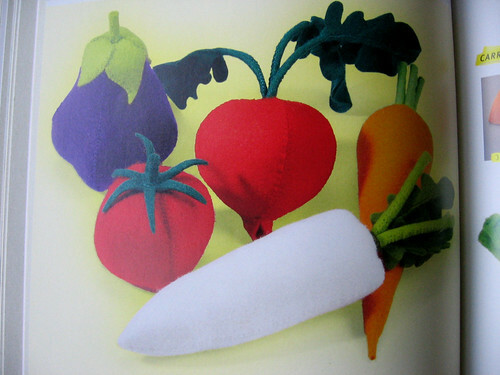 This book really goes above and beyond in the quality and detail of instructions and, with over 70 patterns, is a great value if you have ever wanted to make felt food or other felt softies. All the patterns in this book are handsewn, and there are a projects with a range of difficulty from simpler vegetables to an intricate cake with individual icing swirls and berries on top. 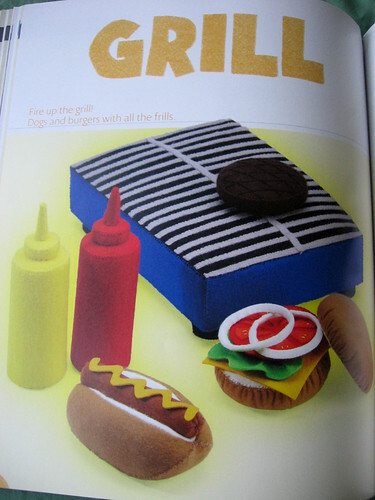 I tend to think of food first when thinking of softies to make from felt, and this book has some really great ones. They have a really nice set of veggie patterns - I love the way they have you make a little tube for the stems, making them more sturdy and realistic. The fruit patterns are amazing and are all designed with either velcro or internal magnets to hold together two halves that can then be "cut" apart with a play knife. 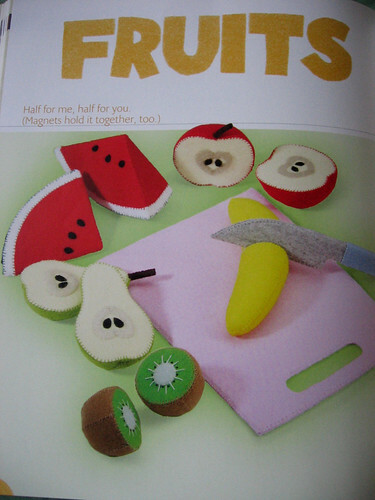 I think this is a great idea that would definitely make them more interactive for a kiddo to play with, but if you wanted you could easily modify the pattern and just make one half without worrying about the velcro part, or combine the two pattern pieces to make a whole fruit that doesn't separate. I also loved the hamburger (or, in our household, black bean burger) with veggie toppings - I can definitely see myself making one of these in the future. 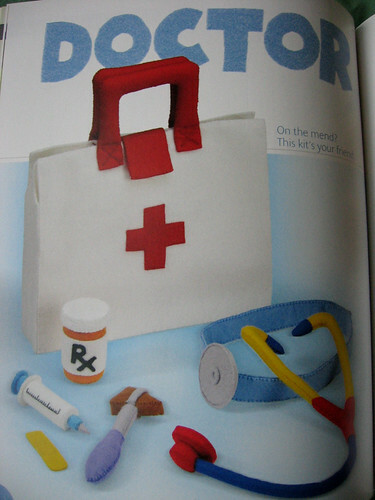 While I immediately gravitated toward the food patterns, the book also has lots of other imaginative pattern ideas, from the doctor set above, to an office set (complete with laptop, calculator, and stapler), to a little girls purse with a cellphone and makeup. It took some serious self restraint not to include photos of every chapter intro page here, they are all so cute! 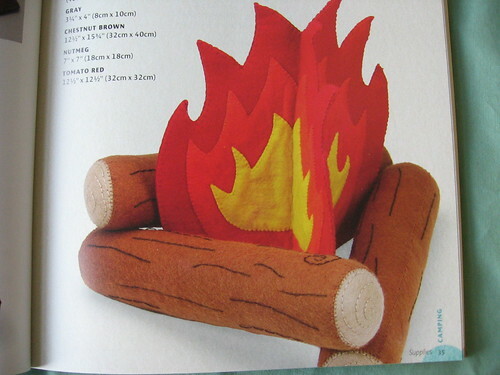 There's also a whole camping set including this adorable campfire - another one I can definitely see myself making in the future. I wanted to try out a pattern to be able to do more than just gush about the cute pictures in this review, and while I was tempted by all the fun fruits and veggies, I decided to branch out since I just made a whole slew of felt food. While my adorable nephew is a bit young to play with felt softies, I decided it wouldn't hurt to start making some for him that his parents can give him when he is old enough to play with them. Since my brother is a contractor and works with tools all the time, I thought some of these cute play tools would be a surefire hit! 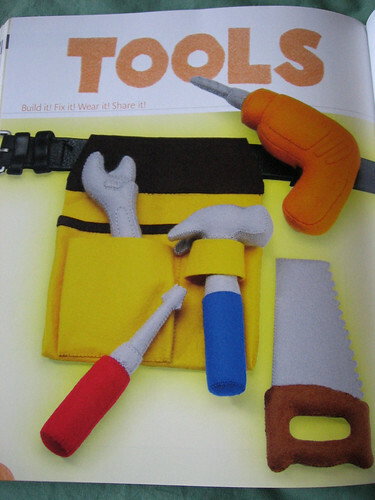 In addition to the large number of projects, something that makes this book stand out among other craft books is the fact that it includes full-size patterns for each project and super detailed instructions with step-by-step photos showing how to assemble the item. I love that when the urge to make something strikes, you can trace the pattern with paper at home rather than having to run out to the copy shop to enlarge a pattern. The patterns are well-designed and with the step-by-step instructions you aren't left wondering how they got it to turn out that way or scratching your head at cryptic written instructions. I made the hammer and wrench and may well make more items from the set in the future. I loved how these both had great details - the little screw adjustor on the wrench and the claw on the hammer in particular. 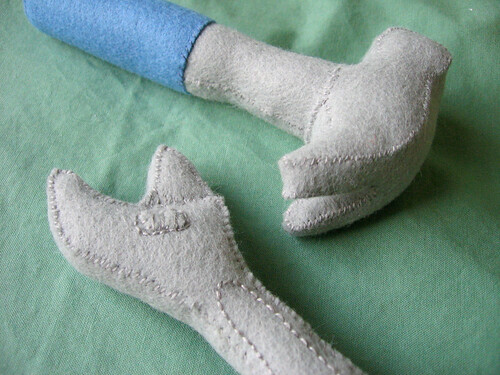 I was hanging out with my mom and a bit distracted when I started making the hammer and I messed up the head a bit, but it turned out great on my second try (I did tweak the order of construction a bit and found that the hammer head came together better when I slightly modified one of the pattern pieces - but I am the kind of person who always finds a way to make the pattern my own way). There are a lot of free patterns for felt softies and especially felt food on the internet, so I imagine some folks don't feel like they need a book. 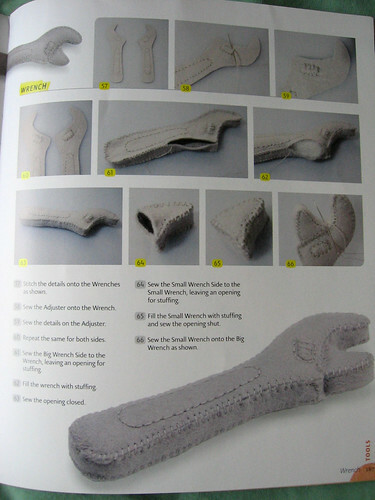 This book really takes it to the next level, though, with creative, detailed ideas - and includes a lot of complicated items like the wrench and hammer above where not only would I not have thought of the idea myself, but I would have been hard-pressed to just make up my own pattern if I was trying to wing it. I really appreciate the fact that this book includes these types of more complicated projects - it seems like often craft books are aimed only at the beginner/intermediate level market, while this is a book that I think a crafter of any level of experience could enjoy and find a project to challenge them. Thanks again to Lark Crafts for the chance to review this excellent book!